Why Escape - Play It Out, LLC - Why do people love escape rooms? What’s so great about escaping? The live action Escape Room industry in the United States is about 4 years old. World-wide, it’s about 11 years old. Scott Nicholson, leading researcher of the escape room industry, has written extensively about the rise of escape rooms. When you consider this in relation to other industries, it’s still in its infancy! Escape Rooms moved to the U.S. in 2014, with about 20 rooms by the end of that year. Now in 2018, there are nearly 2000 rooms across the country. The smart bloggers/escape room reviewers over at Room Escape Artist have been tracking this data for the past several years. See their most recent report here, which contains the stats I just listed and so much more. With this kind of explosive growth, one has to ask why these games are so popular. If you’ve ever played a room, you know that the experience is quite a rush. In a good room, with the right team, players leave the game feeling energized and entertained. This dynamic continues into the group’s next activities, and what could have been a regular night out is suddenly a memorable night of conversation and fun. After a room, players love to break it down. They ask each other how they found this or that clue, they argue over who solved what, they compliment each other on skills displayed in the game, and they give each other a hard time about goofy mistakes. Escaping together brings a new dimension to socializing, and we can’t get enough! In this digital and over-scheduled era, escape rooms bring us back into the real world by dropping us into a pretend world where we put our phones away, think our way through problems, and collaborate with our friends. We remember what it’s like to actually hang out with other people, and that social time is a good time. They help us connect with people we care about, but with whom we thought there was no common ground. At Play It Out, we are watching three generation families have more fun together than they’ve had in years. When grandparents and teens put their heads together to solve a riddle, or impress each other with their puzzling skills, they build bonds that strengthen relationships. Coworkers are finding shared interests outside the office, and mom friends finally have something to talk about besides their kids’ bed and bathroom antics. 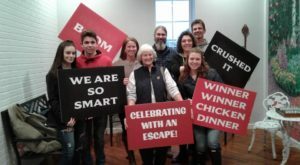 If you’ve been looking for something different to do with people you’ve been meaning to get together with, take the plunge and visit Play It Out in our Souderton Escape Room. If you’re not sure how to get started, our Plan Your Escape tips will get you moving in the right direction. We have two great rooms that are great for first timers and enthusiasts alike. After you play our game, let the fun carry on into the rest of your evening activities. We bet you’ll have so much fun, you’ll find yourself booking our other room in no time!